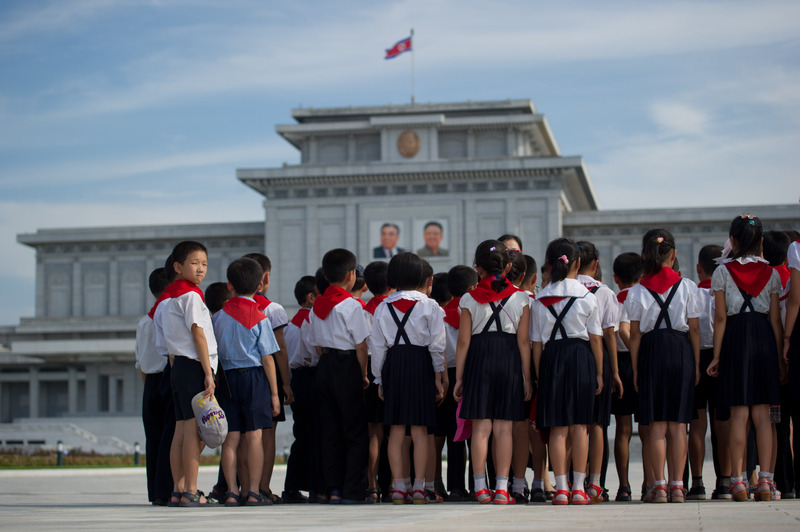 Schoolchildren stand before the portraits of late North Korean leaders Kim Il Sung and Kim Jong Il at the Kumsusan Palace of the Sun mausoleum in Pyongyang, July 25, 2013. Private education began booming in North Korea some 10 years ago and has led the country’s elite, foreign currency earners, and even jangmadang (local market) merchants to pay to educate their children. Music, computers, and foreign languages such as English have been the most popular courses, but other private courses are offered as well. Over this period, private tutors have earned good money helping their students earn good grades, but it is unclear whether such private education can continue. The North Korean authorities are reportedly conducting heavy crackdowns against providers and receivers of private education. In a way, I find myself supporting this move by the North Korean authorities. Private education itself is not a good thing. Private education simply creates a society where people can buy intelligence and diligence through money, and use their money to achieve success. I personally believe that the success of students should depend purely on their own abilities and efforts. An examination of North Korea’s official documents on private education makes it clear that my own thoughts and the thoughts of the North Korean leaders on this topic are not much different. However, when we consider the realities of the country’s education system, the country’s decision to crack down on private education becomes problematic. In countries that emphasize private education, money plays a key role in getting students into college; however, in North Korea this role is played by one’s background (songbun) and network. As North Koreans well know, it is almost impossible for the son of a laborer or farmer to enter Kim Il Sung University. Most of the students studying at universities in the country are the children of the elite. This reality is made ever more clear when considering the educational environment of the children of the elite. Supreme Leader Kim Jong Un, for example, reportedly attended school in Switzerland. As a result, even if private education is abolished, the country will still fail to have a truly competitive education system. This is all because entrance into university in North Korea is dependent on the network and success of one’s parents. Moreover, corruption has become more severe in the country’s universities recently. Money buys entrance into schools, changes test scores, and even allows one to avoid being called out into the fields to work. This kind of corruption is immeasurably worse than the negatives of private education. Private education may have its problems, but at the very least is a transparent way to better one’s abilities. Corruption, however, is done in secret and constitutes a far more serious issue. All in all, while I welcome the crackdown on private education in North Korea, I also do not hold much hope for the future. In view of the country’s current educational state, one has to wonder when students will be able to enjoy free education.